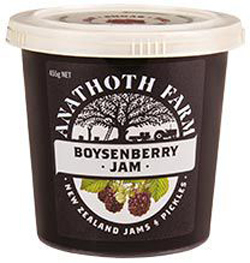 Anathoth Boysenberry Jam is made from nothing but sun ripened New Zealand boysenberries and sugar. No added preservatives, colours and flavours. New Zealand Boysenberries 50%, Sugar. We love visiting nelson during berry season and this brings back memories when we are home. Lovely jam , just like at Granmas house!